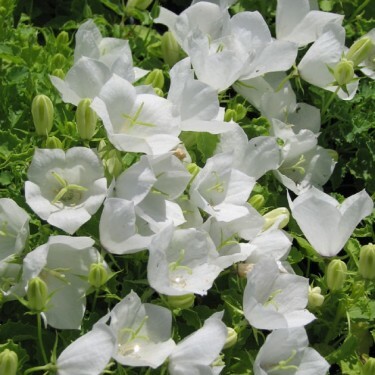 These beautiful, upward-facing, bell-shaped flowers form an attractive ground cover - perfect for edging pathways. 'Rapido White' is an improved hybrid that blooms in late spring, earlier than other hybrids. It is a vigorous, easy to grow perennial. Give it a sunny spot with well-draining soil and it will perform beautifully. A layer of summer mulch is beneficial as it keeps the roots cool and deadheading will help to extend the flowering period. For best growth, you'll want to divide your clumps every two years or so. 'Rapido White' is ideal for rock gardens and containers.